We’ve been warring over sexism and ageism in Hollywood for the past week, since Maggie Gyllenhaal set off a three-fire alarm over admitting that she’d been turned down as “too old” to play the lover of a 55-year-old man. 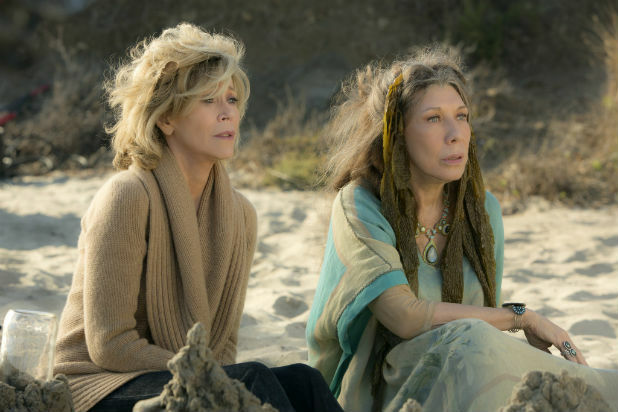 Cue “Grace and Frankie,” the charming, sharply-written comedy of manners set in our contemporary world of topsy turvy sexual identity. Not only are the two leads of the 13-episode Netflix series fabulous women in their 70s, they consistently are paired in the plotlines with younger men. But apparently the producers of this Netflix show, Marta Kauffman and Howard Morris, didn’t get the memo. Jane Fonda, age 77, plays Grace, the well-coiffed wife of Robert, played by Martin Sheen, 74. He leaves their 40-year marriage to pair up with Sam Waterston, age 74. Waterston plays Sol, who dumps his wife Frankie, played by 75-year-old Lily Tomlin as a pot-smoking, caftan-wearing, former hippie. What’s even more revolutionary is that once Grace starts dating, she is paired with men two decades younger than her. In one episode, Grace signs up to an online dating service and ends up on a date with Brian Benben (aged 58! ), fantasizes about dating Corbin Bernsen (aged 60!) and has a quick make-out session with Irish actor Tim Murphy, whose looks to be about the same age as the others. Far from being too old to play the comic leads, Fonda and Tomlin embrace their roles with relish, as does the entire cast. Netflix doesn’t do anything by accident. There’s undoubtedly an algorithm in their subscriber base that surfaced a burning desire to see a comedy starring women in their golden years acting like women, not senior citizens. And it’s a distinct pleasure to see the hand of Marta Kauffman (“Friends,” “Dream On”) with Howard Morris (“According to Jim”) back at the tiller. Point is, Hollywood – Netflix made it work. Why can’t you?